Te Moana-nui-a-Kiwa / the mighty Pacific Ocean pervades Night Swimming — whether swimming or sailing, surfing or drifting, or just quietly contemplating, the author is never far from its shores. These are lyrical poems of aroha and whanau, loss and yearning, renewal and erasure — the tide going out, the tide coming in. Kiri Piahana-Wong is a New Zealander of Māori (Ngāti Ranginui), Chinese and Pākehā (English) ancestry. She is a poet, editor and publisher. Night Swimming is her first collection. ISBN 978-0-473-24555-9,148 x 210mm, pb, b&w, 50pp. *Anahera charges $3.50 postage for books sent out within New Zealand, and $10 to all international destinations. If you are purchasing from overseas please make sure the correct shipping cost of $10 is entered in the shopping cart as the cart defaults to $3.50. *This title is now also available from Amazon as an ebook. “Night Swimming is full of brilliant moments that give a new sense of understanding. A reader will find the gold very easily in this little collection in which she gives voice to her Maori, Chinese and English ancestry.” —Hamesh Wyatt, Otago Daily Times. 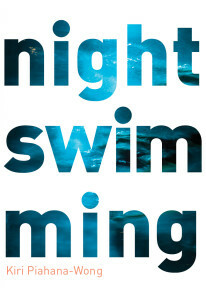 “Night Swimming is a collection abundant with striking imagery and imagination. It marks a promising debut by an author carving out her own distinctive themes and ideas.” —Siobhan Harvey, Beattie’s Book Blog. “A near-perfect 9.5 leap from the high board.” —Vaughan Rapatahana, Landfall Review Online.